The month of July brings in monsoon, that means rains, overflowing canals and rivers, streets filled with water, clothes not drying, cloudy days and so on..Monsoon also demands frying fritters, eating chaat and sipping hot tea. But with all the water around it causes a lot of germs to grow and here’s when one needs to eat and live healthy to shove away the diseases. Hence, I thought of heating up our kitchen using the microwave. Yes, you got me correct, this month’s ONLY theme is Microwave Cooking. A microwave oven, or simply a microwave, is a kitchen appliance that cooks or heats food by dielectric heating. This is accomplished by using microwave radiation to heat water and other polarized molecules within the food. There’s always a debate on how safe microwave cooking is or whether nutritional value of food diminishes by cooking in microwave..and I’ll not get into that. It is definitely one’s personal choice. As far as I’m concerned, I’ve found microwave cooking very useful and have never faced any health concerned problems because of that. I’ve found microwave cooking a fast, low oil cooking method. There are some important things to be taken care of while using a microwave..
Cover and cook so that the bacteria is killed. Mix the food half way through cooking or heating. After the microwave stops, let the food sit as it, as it will still be cooking under heat, like in a pressure cooker. Use microwave safe vessels and do not use plastics that may melt if used. The harmful substances in plastic may leak into the food. Cook vegetables until just done (not overcooked) to retain nutritive value. Avoid cooking shelled eggs in a microwave as they tend to explode. 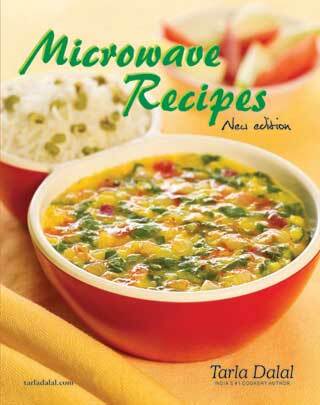 For a detailed read on microwave cooking read here and here. Please make a note that, we are going to focus largely on the 'Microwave'feature of the Microwave oven. Grill and Oven can also be used. So send me your vegetarian entries before 1st August. There’s a giveaway cookbook called, Microwave Recipes, new edition, authored by Tarla Dalal and is sponsored by www.tarladalal.com. The winner of the giveaway will be selected from the Indian Entries only as the book gets shipped only in India. However, anyone, who can provide an address in India can add their entries to Indian entries linky. The book is given only to the followers of my blog. The event runs through the month of July. There are two linky tools, one for India and the second for ‘Other Countries’. Post your entry in any one of the linkys. Only Vegetarian entries accepted, however, eggs are allowed. Use of logo is mandatory, as it gives a clear visual message and thus helps spread the word. Any number of fresh entries can be sent but only two entries from the archives are allowed. For archived entry, please repost the archived link in one of your current month’s post. In case you have a difficulty linking up, please mail me your entry to cookingoodfood@gmail.com and I will do the needful. Nice event, will surely send some entries..
An interesting event. i will send my entries. Will definitely take part in this series! Nice theme..will try to send entries. Lovely event. Will try to send some. happy hosting pari and i m in! Thanks Pari, hv linked the dhokla post to your event & added the logo. Hi Pari, linked the Tangy tomato Chutney to your event and met all the requirements of your contest! P.S - instead of the name of the dish, I put my own name can that be changed? ?